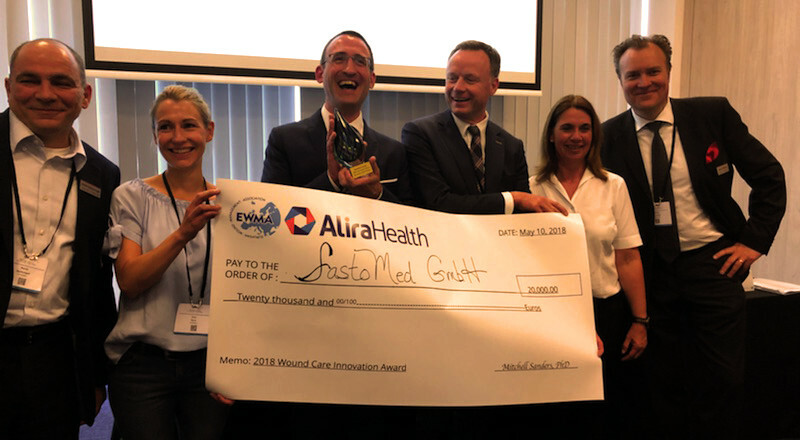 Krakow, Poland, May 10, 2018 – Alira Health and the European Wound Management Association (EWMA) are pleased to award SastoMed GmbH the 3rd Annual Advanced Wound Care Innovation Award of €20,000. We would also also like to recognize our finalists companies, Otivio AS, Next Science Group, and Aurelis Pharma AG. Dr. Mitchell Sanders, Chief Scientific Officer at Alira Health added, “This year was a stellar program. Thank you to EWMA, SastoMed, the finalists, esteemed judges, HEOR KOLs, and sponsors (SmartTrak, Alira Health, Imbed Biosciences, Mimedix, and Baril Corporation) of the 2018 Advanced Wound Care Innovation awards. See you next year in Gothenburg, Sweden at EWMA 2019. SastoMed GmbH based in Georgsmarienhütte, Germany has developed a hemoglobin-based wound spray, which can be used easily in everyday wound healing treatment as an adjunct to the current Standard of Care. The product improves tissue oxygenation by means of facilitated diffusion. A large body of peer-reviewed publications already available show the significant potential this product could have on for example healing times, recurrence, wound pain, and total cost of treatment. To learn more, visit http://granulox.de/en. Aurealis Pharma AG is a biopharmaceutical company based in Kuopio, Finland and Basel, Switzerland, has developed an effective, safe and economical treatment method that greatly improves the quality of life for chronic inflammation and cancer sufferers. They have developed an innovative wound healing therapy which, by using genetically modified lactic acid bacteria produces multiple therapeutic proteins and antibodies in the diseased tissue on a continuous basis. Therapeutic efficacy has been shown on fibroblast migration, macrophage activity, and angiogenesis. To learn more, visit http://www.aurealispharma.com/. Next Science Group based in Chatswood, Australia, pioneers innovative, proprietary technologies to address the problem of bacterial biofilms. Next Science is following a unique, unprecedented approach to eradicate biofilm bacteria with a proprietary, non-toxic technology that disrupts the biofilm’s extracellular polymeric substance (EPS) matrix. Their most current development, a breakthrough antimicrobial wound gel, is powered by this patented technology. It deconstructs the bacterial biofilm EPS matrix, destroys bacteria within the gel, and defends from recolonization while maintaining a moist wound environment. To learn more, visit https://www.nextscience.com/. Otivio AS, a privately-owned company based in Oslo, Norway, are addressing peripheral arterial disease with pulsating negative pressure applied locally, directly on the skin. Their core technology enables increased blood flow to the limbs of a patient. This therapeutic approach increases blood flow, most likely due to the fact that the pulsating nature of the negative pressure applied avoids constrictive veno-arterial reflexes. Clinical studies have shown positive results. To learn more, visit https://www.otivio.com/.